Please refer to our stock # LibE65 when inquiring. 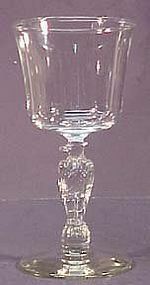 This Libbey eagle stem is very popular. It stands 6.5" tall and is 3" wide at the top. All three are in excellent condition. Made before 1980.